I did a search to find the step. I think I started out with just step stool, and also RV step and industrial step. The problem I am trying to solve with the step is lifting my saddle on my horse. I have had surgery on both my shoulders so it is hard for me to lift very high. I was looking for something safe to have next to my horse so if she moved around she couldn’t tip it over and get tangled up in any legs on the stool. I also needed it to be wide enough to stand on with both feet and not too heavy to move around. I hope it works for me, It should be here on Friday. I really had to think hard about spending that much on a step so I hope it is worth it and lasts forever. 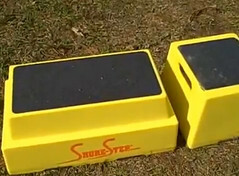 Ann mentions that the Shure-Step has no legs so her horse won’t get tangled in it. Equestrian Centers everywhere should look at the benefits of using steps without legs for this very reason. Her last concern is that she hopes it will last forever. That’s a long time, but this step stool is designed with a double wall construction and is rated for 500 pounds. It can take a beating and it will be around for a long, long time. There are Shure-Steps still in auto repair shops that have been in service since 1996, the first year they were made.